The most exciting car to debut at the Detroit Auto Show this January could well be the 2009 Mercedes McLaren SLR Stirling Moss. Hit the jump to see this beast in our gallery below. The 2009 McLaren SLR Stirling Moss will officially make its debut at the Detroit Auto Show next month, but Mercedes decided to tease us with these shimmering photos of the last of the Mercedes-McLaren partnership. Designed with Stirling Moss' 1955 300 SLR racer in mind, the 2009 SLR Stirling Moss kicks it up a notch. Based on the SLR Roadster, the Stirling Moss features carbon fiber bodywork wrapping an SLR722-supplied 650-hp supercharged 5.5-liter V8 mated to a five-speed auto. As with the SLR722, the Stirling Moss can reach a top speed of 217 mph and will reach 60 mph in 3.5 seconds. The roofless Stirling Moss features smaller "swing-doors" with a two-piece tonneau cover that can cover either the entire cockpit or just the passenger side. A retractable air brake, like the one on the Veyron, automatically deploys during hard braking from speeds above 75mph. Stuttgart– Mercedes-Benz and McLaren are adding the crowning glory to the model family of their highly successful SLR super sports car with a new, uncompromisingly spectacular car. There is neither a roof nor a windscreen to separate the driver and passenger from the outside world; they enjoy unadulterated high-speed excitement with all the attributes of a speedster. The new SLR Stirling Moss is also characterised by the most sophisticated technology and a breathtaking design which reinterprets the SLR legend. With 478 kW/650 hp the SLR Stirling Moss accelerates its V8 supercharged engine from standstill to 100 km/h in less than 3.5 seconds, and has a top speed of 350 km/h – no other series-production car is at the same time so open and so fast. This extreme concept makes the new high-performance sports car a legitimate bearer of the name of the British motor racing legend and Mille Miglia record-holder Stirling Moss, who drove the legendary Mercedes-Benz SLR racing cars from victory to victory during the 1950s. The exclusive SLR Stirling Moss rounds off the current SLR family and is limited to 75 units. It is priced at 750,000 euros. The SLR Roadster will cease to be manufactured at the end of May 2009 as planned, and production of the SLR Stirling Moss will commence in June 2009. Three letters are all it takes to make car fans' hearts beat faster: SLR. In the 1950s the Mercedes-Benz SLR 300 celebrated victory after victory. It won the Mille Miglia and the Targa Florio as well as the Tourist Trophy. It was driven by the stars of the time: Juan Manual Fangio and Karl Kling – and, first and foremost, by the British racing driver Stirling Moss. At ten hours, seven minutes and 48 seconds he still holds the Mille Miglia record. This is why the modern-day version of the legendary SLR carries the additional words "Stirling Moss" in its name. As the new SLR Stirling Moss unites the character of the current SLR models with the fascination of the SLR of 1955. The core values of both the historical and the present-day SLR models include an exciting new design, innovative technology, high-class materials displaying perfect craftsmanship, and, above all: a unique driving experience for all the senses. Whilst the 300 SLR earned its spurs on racing circuits the world over, the new member of the SLR family is not designed for the racetrack. Although it sets new standards in terms of technology, performance and excitement – just like its forebears – it is aimed at individuals who have exquisite requirements and nurture very special dreams. Remaining totally true to the specifications of the 300 SLR, the new Silver Arrow's equipment is extremely sophisticated and yet at the same time decidedly spartan, doing without both a roof and side windows. There are just two wind deflectors a couple of centimetres in height to protect the driver and passenger from the airflow. Two air scoops integrated into the bodywork serve as roll-over bars. With this extreme concept the new SLR Stirling Moss is visually very different from all the other vehicles which belong to the elite sports car class. Just like the legendary racing vehicles of yesteryear, the SLR Stirling Moss dazzles with its superlative performance. Accelerating from zero to 100 km/h in less than 3.5 seconds and with a top speed of 350 km/h this puristic high-performance sports car denotes completely new dimensions in open-top driving. And not just because of the impressive performance figures; every time drivers take to the wheel of the SLR Stirling Moss their senses are addressed with a previously unheard of intensity, conveying a driving experience in its purest and most sensual form. This automotive thoroughbred thus facilitates the kind of open-air feeling that is utterly unique for a road-going vehicle. The SLR Stirling Moss, its entire bodywork made of fine lightweight carbon fibre, represents a stand-alone design concept. Whilst the Mercedes-Benz designers were working on the body of the new SLR Stirling Moss, they were fully aware every single moment that they were creating a vehicle with a top speed of 350 km/h. At the same time this supreme athlete is highly reminiscent of the SLR racing cars from the 1950s, whose design idiom still never fails to impress to this day. The SLR Stirling Moss sports an exciting, pronounced arrow-shaped form and is characterised by an elongated bonnet and a compact, muscular rear. As there is no windscreen, the exterior and interior flow smoothly into one. The bonnet also stretches from its striking tip right down into the interior, giving the vehicle body a distinctly sleek air. Even when standing still, the sports car radiates such dynamism that the observer immediately falls under its spell. Further eye-catching features include two air scoops behind the driver and passenger. They carry additional roll-over bars, also uniting the traditional and the modern. The wings are powerfully contoured. Black-painted ventilation "gills" sitting facet-like on the sides and on the bonnet also cite the legend. A thrilling interplay of light and shadow ensues through the expressive lines, underlining the dynamic overall impression. Exactly as they were on the shining historical example, the side skirts on the new SLR Stirling Moss are also very high. This prompted the designers' decision in favour of folding swing-wing doors which open forwards. The vehicle can be closed by two tonneau covers which are carried in the boot. When both tonneau covers and the doors are closed the SLR Stirling Moss resembles a sculpture. In keeping with the puristic exterior of the vehicle, the interior is also reduced to the bare essentials. Surfaces penetrating each other in the instrument panel and doors make for an exciting atmosphere and resonate perfectionism. A mixture of high-class authentic materials such as carbon fibre, aluminium and fine-quality leather sets the style here. An aluminium plate carries the engraved signature of Stirling Moss and covers the area around the shift lever. Developers working on the Stirling Moss were able to fall back on a wealth of experience gathered when producing the SLR Coupé and Roadster, in particular where the technical base was concerned, with its extravagant carbon-fibre design, high-performance suspension and throaty V8 engine. The common denominator uniting the Stirling Moss with the other members of the SLR family is the aerodynamic concept with a closed underbody and a diffuser in the rear bumper for maximum possible downforce at the rear axle – with one difference: the diffuser here is considerably larger than that on the coupé and roadster. Thanks to the high-precision work carried out in the wind tunnel, the SLR Stirling Moss always generates sufficient downforce for extremely safe handling. But the driver can also manually operate the AIRBRAKE in order to increase the contact pressure further, during particularly sporty driving, for example. The AIRBRAKE is also raised during powerful braking at speeds above 120 km/h, so as to stabilise the vehicle even more in such situations, thus facilitating maximum possible deceleration. 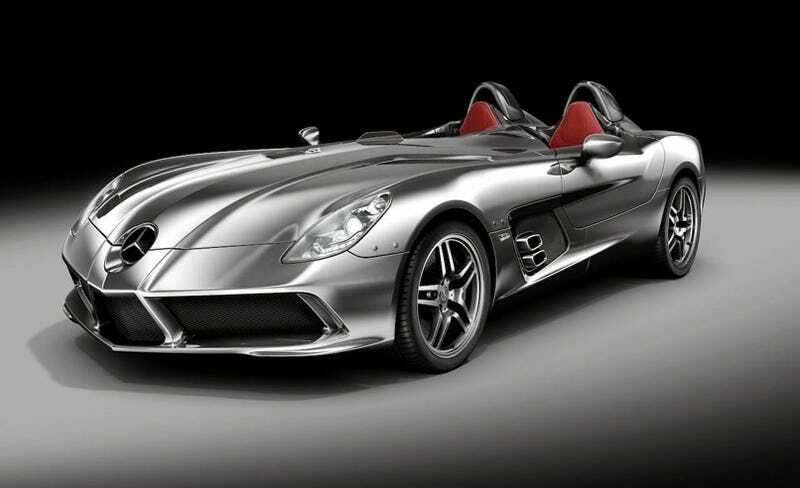 The new SLR Stirling Moss is the kind of high-calibre speedster coveted by the sporting gentry and enthusiasts alike. At the same time it is a collector's item which marks the pinnacle of an era and, for the foreseeable future, at least, the final curtain for the SLR. In May 2009 production of the SLR models will cease; only a total of 75 units of the Stirling Moss will be manufactured between June and December 2009, bearing chassis numbers from 1 to 75. Not only does this exclusive vehicle represent the conclusion of the current SLR family; it also serves as a very special thank you to the most loyal of SLR customers, for they are the only ones able to acquire a Stirling Moss.